These are lots of fun both to make and use and, even though I began this project with children in mind, let me tell you that it’s most often the adults who come out of the bathroom exclaiming with delight and wondering where I bought the fish tank soap. For the kids, I figure that anything that encourages washing your hands, or gives the little darlings something to look at while they are washing their hands (thereby, one hopes washing longer) is a very good thing. that are 2 inches long by 3/4 inch high, but I think they are only sold in bulk amounts. It’s worth searching Amazon, though; they had a few other possibilities that might work for you. Clean and rinse the soap dispenser bottle. Fill it about three quarters full with clear liquid hand soap. Sort through the available seashells and select as wide an assortment of colors and shapes as you can, keeping in mind that each seashell will need to fit through the top of the bottle. I was able to find some long, spiral shells which I set aside to add on top of the rest. Drop the seashells into the bottle and push them to the bottom with a skewer, coffee stir stick or something similar. Some of the seashells will fall to the bottom quickly, but others will have air trapped inside and you may need to poke them with the skewer to turn them around and let out the trapped air. Once all the seashells have fallen to the bottom, use the skewer to arrange them in a pleasing arrangement. Keep the middle free of shells, as the pipe for the pump mechanism will need this space. Add the plastic aquarium plant, using the skewer to push it into place among the shells. Next, add one or two goldfish, using the skewer to place them in front of the plant. I rearranged a few shells at this point, bringing the spiral shells up to support the fish so that you could see the larger one very clearly, with the smaller one being visible at a different angle. Gently now, so you don’t dislodge your arrangement, put the soap pump mechanism into the bottle and screw it firmly into place. Give it a few pumps to get the soap flowing properly. 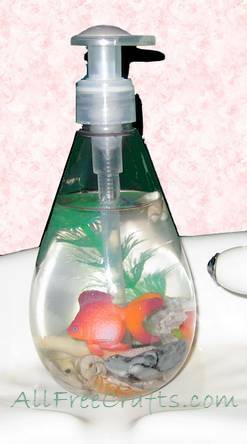 Set the soap pump aquarium beside the sink in your bathroom and wait for the reactions. Enjoy.